Passer alle Tesla Model S med original luftfjæring. The Unplugged Performance Plug-n-Play High-Performance Shocks For Air Suspension has been developed as a racetrack-derived, street compliant suspension upgrade for all Tesla Model S variants with Air Suspension. The higher spec Tesla Model S variants (P85D, P90D, P100D, etc.) come equipped standard with Tesla’s advanced air suspension. While the factory suspension has many great features such as height adjustment and GPS memory, it has limitations for handling that are typical of factory equipped air suspension systems. Although comfortable on the street, the factory suspension does not provide the handling, grip, and stability preferred by driving enthusiasts for spirited driving due to the inherently soft factory settings designed to please the average Tesla owner. This limitation prevents the Model S from reaching its full potential as an ultra high-performance sports sedan. Engineered for driving enthusiasts, this performance upgrade overcomes the natural propensity of air suspension vehicles for slop and roll during spirited driving and reduces crash over bumps, without compromising daily drivability. Once installed, the upgrade works in harmony with the standard air suspension controls without error or change of all standard functionality. Notes on lowered cars: Many Model S owners have utilized Unplugged Performance lowering brackets to reduce ride height, improve aerodynamic efficiency and reduce body roll. When the Model S is lowered, the factory suspension remains unchanged, equally soft as standard, however typically lowered car owners will want a slightly more sporty setting to maximize performance. As a result, when paired with a lowered car this system will maximize handling performance. The system has been developed over the course of 18 months to plug-n-play on all variants of Model S air suspension. After installation the car simply works as normal, requiring no additional calibration and introducing no vehicle errors. All of the factory air suspension functionality (height adjustment, GPS memory) remain unaffected. The front and the rear units all employ user adjustable valving which may be tuned to each owner’s specific driving preference. All sets arrive pre-adjusted to Unplugged Performance’s recommended setting (high-performance street spec), however, they may be adjusted more firm for pure racing or softer for comfort comparable to the factory units they replace. 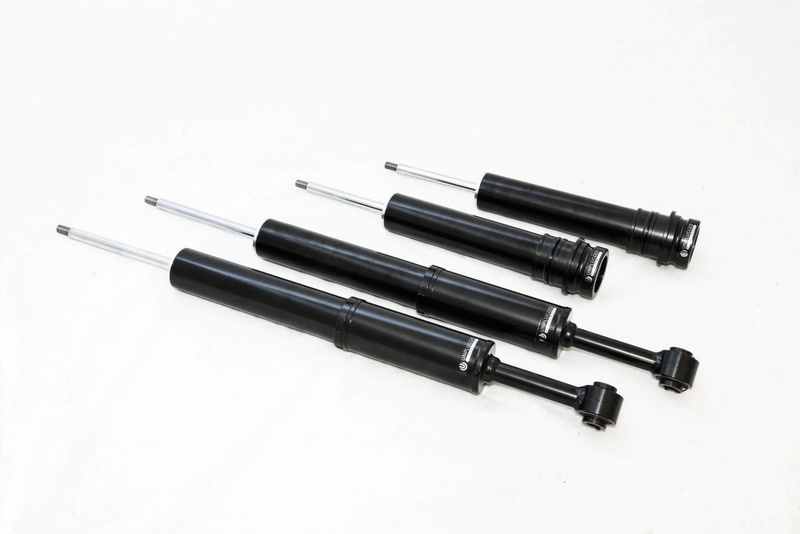 As a result of the specific valving and adjustability, these high-performance shocks are equally suited for daily driving as they are for motorsports use. This product is compatible with every version of Model S factory air suspension. It may be used on factory height cars or on cars that have been lowered. For maximum performance, we suggest pairing with Unplugged Performance lowering brackets.